It may often be useful to backup Microsoft Outlook. Should you reinstall Outlook or perhaps move a version of Outlook to another computer, you will need a backup of all your data. It may also prove to be a good idea to backup Outlook even if you do not plan to move or reinstall the program. In order for your computer to be damaged, stolen or similar, you will lose all your emails, contacts, tasks, etc. Fortunately, it's quite easy and quite free to back up Outlook. The latest version of Outlook is called Outlook 2016, and if you use this version, you also have the option to create a backup through Microsoft OneDrive. 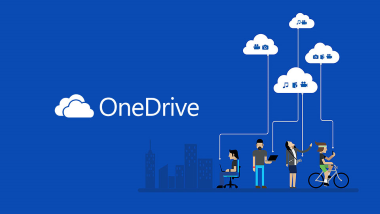 OneDrive is a disk feature that is included with most Windows operating systems, and allows you to store sensitive information online so that they are always available to you, provided you have an internet connection. If you do not have OneDrive installed or do not have access - you can read more and the program here. To back up Outlook, copy the files that have.pst to last names, from the Outlooks folder to another destination. It could be a CD or a USB drive. The mentioned.pst files are found in your personal store folder, which stores Outlook important things, such as your emails, contact information, meeting appointments, tasks, and more. By finding out where your computer.pst files are located, you can easily backup Outlook for free and quickly. To find the.pst files location, start by opening Outlook. In Outlook, select the File tab. Then select Information that you find in the menu on the left. Then, select Account Settings. When clicking, a box pops up, where Account Settings again - press it. In the window that is now opened, select the Data Files tab. Here you will be presented with a list of all your accounts in Outlook. Each of these has its own.pst file. Many will only have a single account / data file, so do not worry if there is only one. Now, choose which account you want to make a backup of and click Open File Location and a new window will open. In that window you will find your data files (.pst). Now you have found Outlooks data files and it should be no problem to back up these files now. 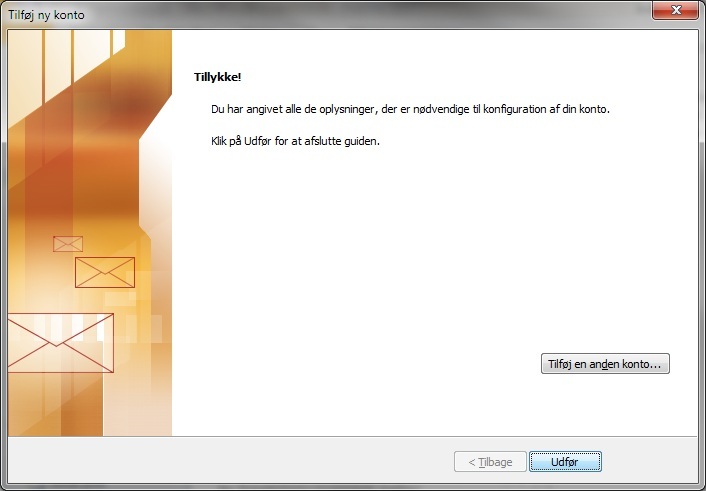 Close the account settings dialog box, and then close Outlook. Return to the folder with your Outlook data files. Copy the files to your desired backup destination (Hard disk, CD, DVD, USB, etc.). If you need to restore your Outlook to another computer or need your backup data files on your current computer, you can import the saved files to Outlook. 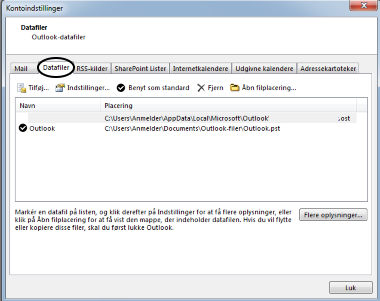 Simply open Outlook and choose File. 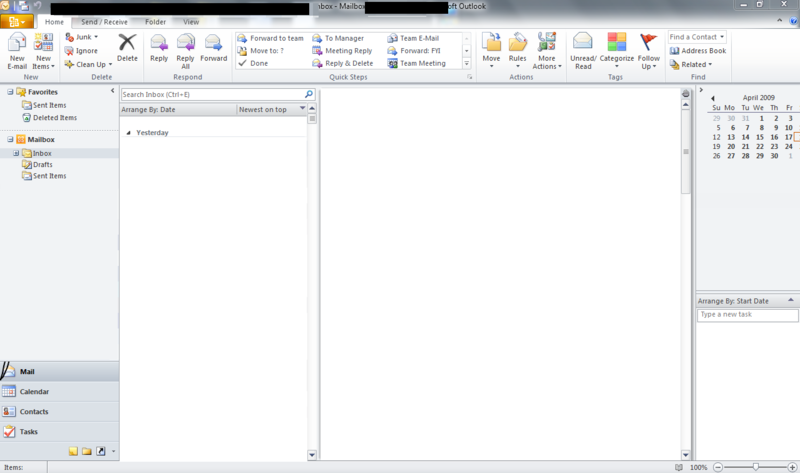 Then click Open on the menu on the left side of Outlook. Now select Import to open the Outlooks import / export guide. Choose Import from another application or another file and click Next. Now select Outlook data file (.pst) under Select file type and click Next. To select your backup, click Browse, find the given data file, and select Open. Then choose whether you want to overwrite duplicates, leave them or remove them and click Next. 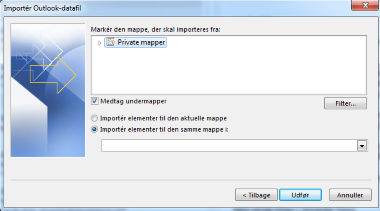 If necessary, enter the password and select the mapp that you want to import the files from. Most likely you want to import the entire data file so that you should choose Outlook Data File and include subfolders (the fly). 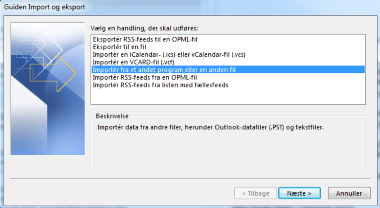 If you want to import the data file for your current Outlook data file, then select import devices for the current folder file. Otherwise, click Import Devices to the same folder and select the location. 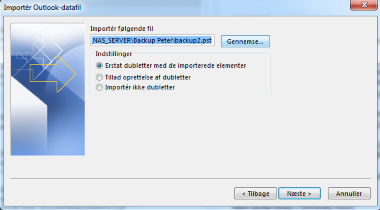 Click Done to complete the import and restore of your backup data files. If you have not affiliated with Outlook, we would highly recommend it. 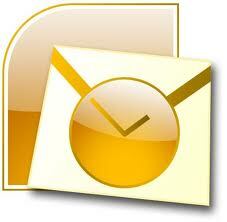 Outlook is very cooperative with other email services such as gmail.com. The only requirement is that you have Outlook installed and then you can attach your email account. Outlook even takes care of syncing your emails to your Outlook service, and it may take some time - depending on how many emails you have left. Then you receive emails directly in Outlook, and you can of course also send emails from Outlook. The many features and options in Outlook make it easy to choose, both for private but also for businesses. Outlook is also designed for all conceivable operating systems (Mac OS, Windows, and application for your smartphone) so everyone can join. It also means that you can access your Outlook account on the go. 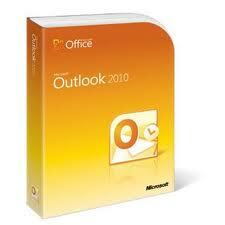 You can find the different system variants of Outlook using this link.